Baby plate is easy to clean with soapy water or place in dishwasher always looks like new, You can also use it in the microwave and freezer "
Q:What are the dimensions? A:Baby placemat dimensions is 10.50 x 1 x 7.70 fits most highchair Trays. Q:What material is the silicone placemat made? A:100% Silicone 100% food-grade non toxic, BPA, PVC, and phthalate free. Q:Does placemat stick on the highchair? A:Yes, our kids placemats designed to stick on the most of high chair. Q:Can I use it in the microwave? A:Yes, You can use it in the microwave, freezer, dishwasher. FDA APPROVED 100% Food-Grade Material, eco-friendly, bacteria resistant. Free of BPA - PVC Lead and phthalate. Hygienic, safe and soft non slip silicone tableware for babies and toddlers. Soft smiley, bright and smooth to touch, great for building your child's confidence throughout their early meal experiences. 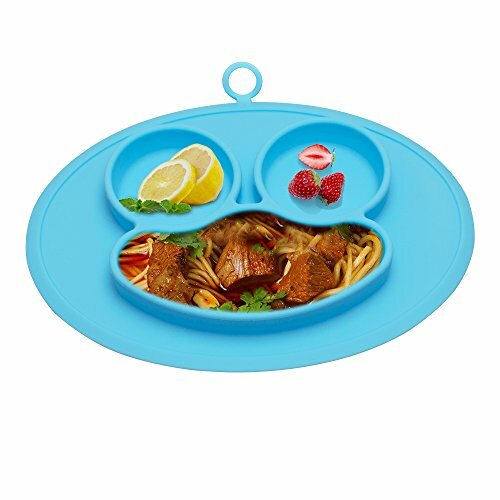 SEPARATE FOOD PORTION COMPARTMENTS ENCOURAGE A MEASURED HEALTHY DIET - The perfectly rounded edges allow easy access for little fingers and prevent food from getting stuck in corners. CONVENIENCE TO USE Anti-oil, water resistant Easy to clean by hand or by dishwasher.After cleaned and stored in a clean and dry place away from direct sunlight. Temperature range: -104 ~ 446 (℉), plus microwave ,freezer and oven friendly! PORTABLE, VERSATILE AND EASILY FITS INTO YOUR BAG - Perfect for taking to kindergarten,your friends house and days out at the park. Relax knowing that your baby is eating balanced and healthy, and take a smile wherever you go! If you have any questions about this product by URSMART, contact us by completing and submitting the form below. If you are looking for a specif part number, please include it with your message.